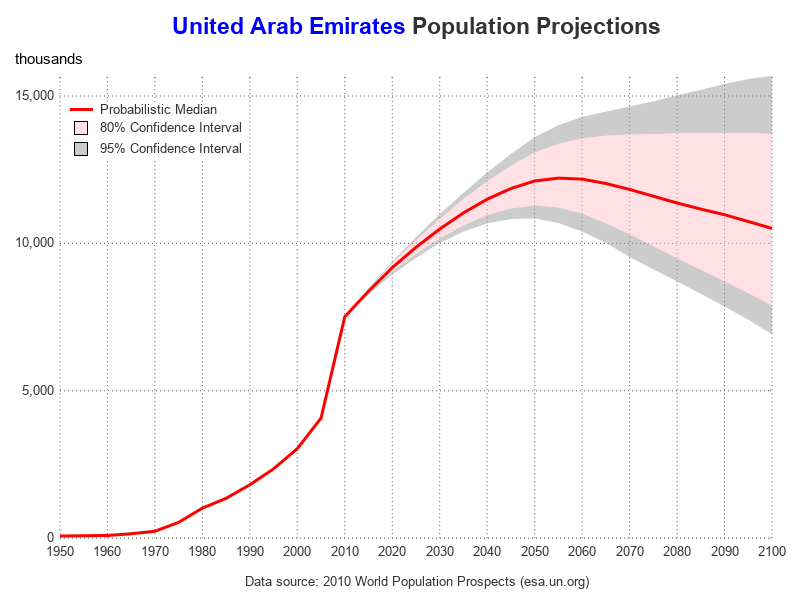 During the year 2020, many countries and areas will be conducting their decennial census, and making projections to estimate what their population will be in the future. 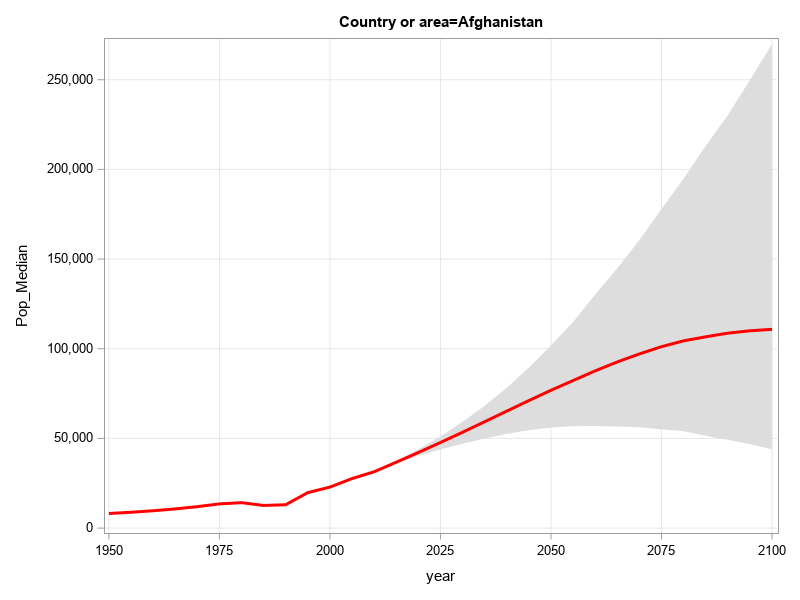 Therefore I decided to dust off one of my old SAS/Graph samples based on the 2010 census, and rewrite it using more modern technology. That way, I will be ready to plot new data and forecasts based on the 2020 census, when that information becomes available. 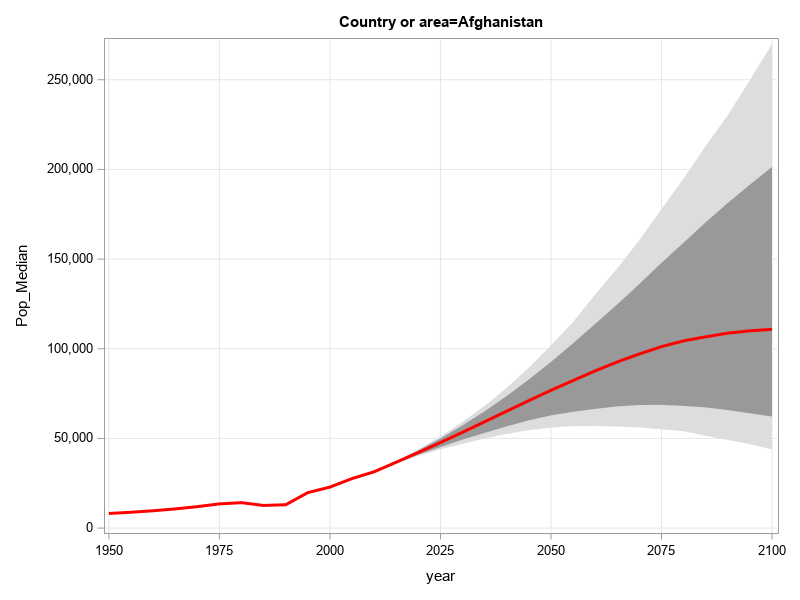 Follow along, and learn a few tips about plotting population projections! 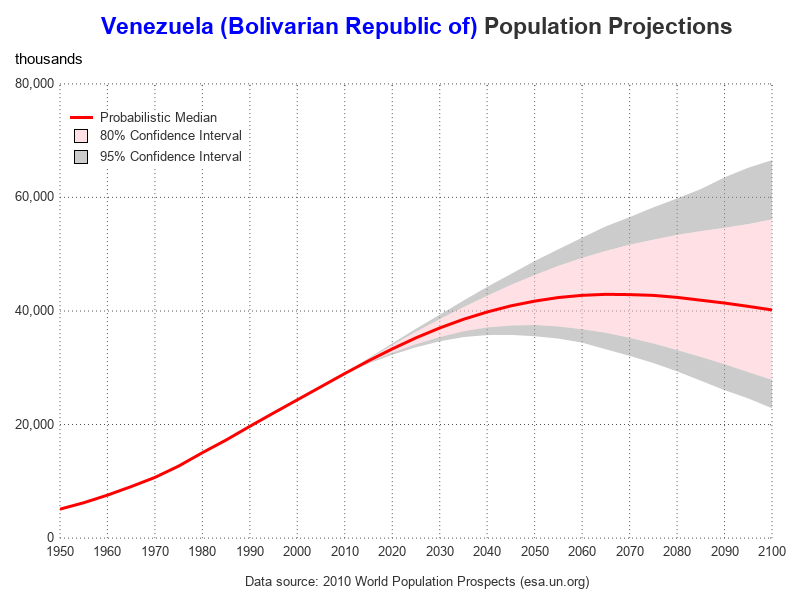 I downloaded their spreadsheet, imported the data into SAS, and was able to produce a basic graph of the population projection with the following minimal code. 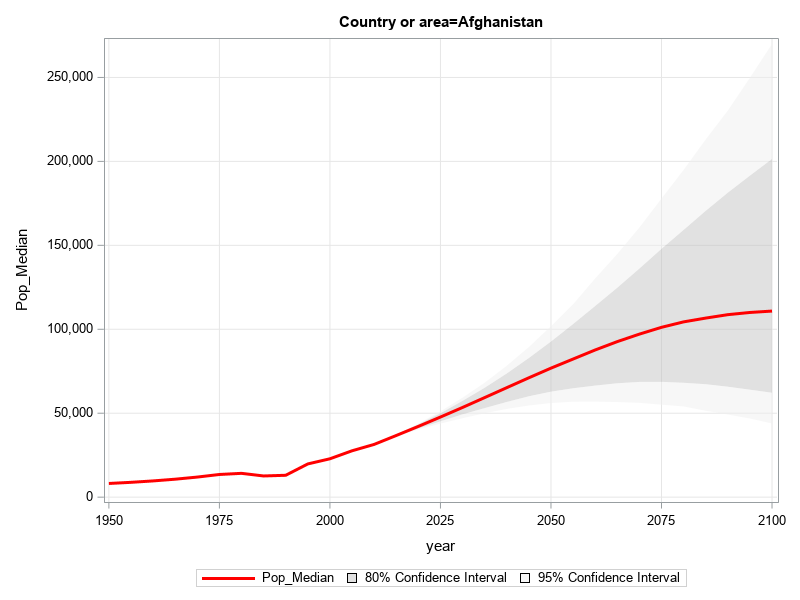 Now, let's add the shaded area for the 95% confidence interval. With the older SAS/Graph software, you could shade the area under a line (but not the area between two lines). 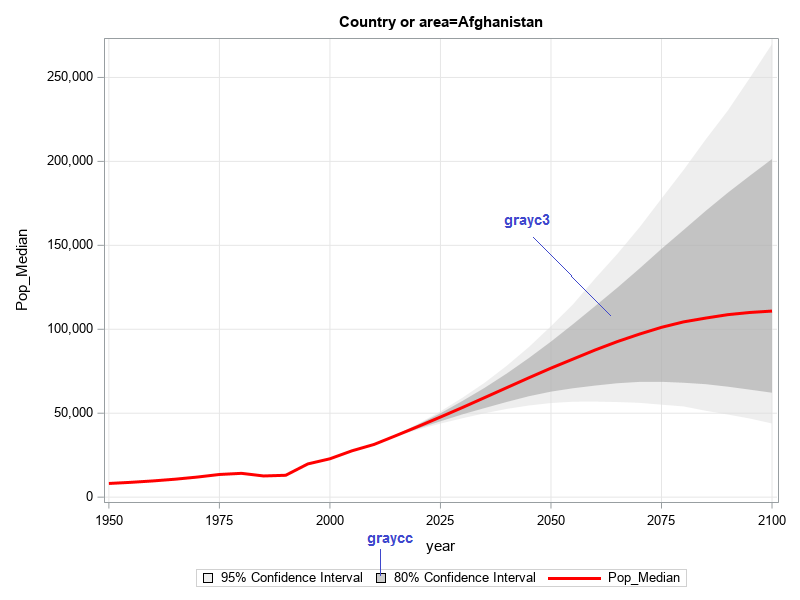 And therefore to get the appearance of a shaded confidence interval, you had to play some tricks with your code. 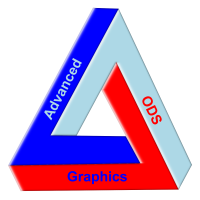 By comparison, with SAS's newer ODS Graphics software, this functionality is built-in. In SGplot, that's a simple matter of adding a band statement, and specifying which variable in the dataset represents the upper and lower edge of the band. 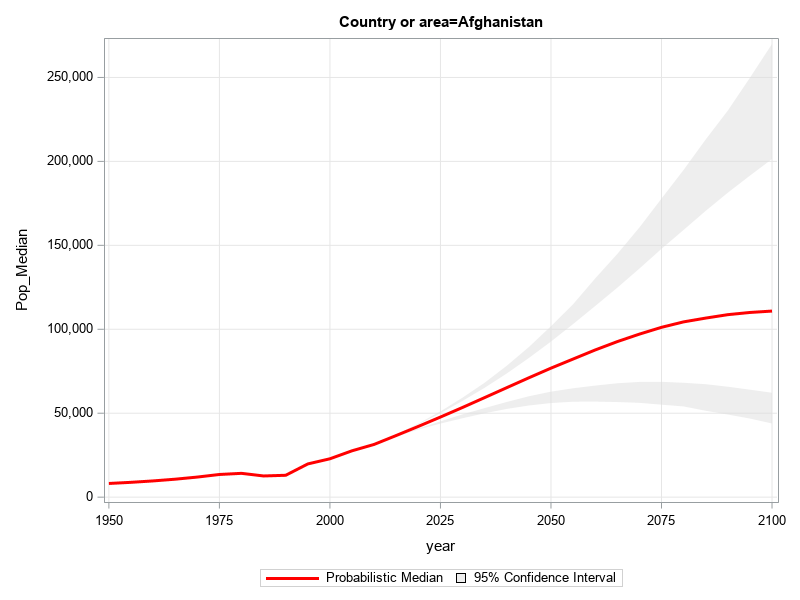 Next, let's add a darker gray area for the 80% confidence interval. Transparent Shading Can Be Deceptive! 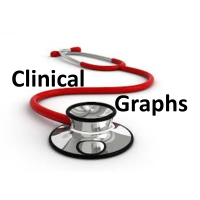 But, being a Graph Guy, I wanted a little more from my graph. I wanted to be able to easily see exactly where the red line is, in relation to the grid lines. But the gray confidence bands obscure the grid lines. To get around that, let's (naively) try making the shaded confidence bands transparent, by adding transparency=.50 as an option on the band statements. Now you can see the grid lines through the shaded bands, but if you look really closely, you'll notice that the colors/shades in the graph no longer match the colors in the legend. The reason for this is that the 80% band is layered on top of the 95% band, and the transparent colors 'combine'. This causes the color you see for the 80% band to appear darker in the graph (since it's actually a combination of two transparent bands). I used the Pixeur tool to sample the colors in the graph and the legend, and found the dark gray in the graph is grayc3, whereas the dark gray in the legend is graycc (see where I've marked in blue in the graph below). Here's a trick to get around that problem of the overlapping transparent colors combining. Rather than using two color bands that overlap, break the bands into 4 pieces that don't overlap. Here's a graph with the two pieces that go from the outer edge of the 80% to the outer edge of the 95% area. 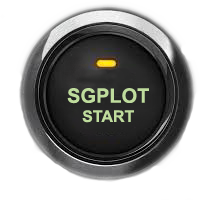 Now that we've got the basic plot worked out, let's add a few finishing touches! There's quite a bit of code below, but I wanted to show you the difference in the amount of effort required to produce a really nice plot (below), and a plot that's OK, but not great. In my opinion, it's worth the extra effort - especially when you can write the code once, and produce many different graphs! 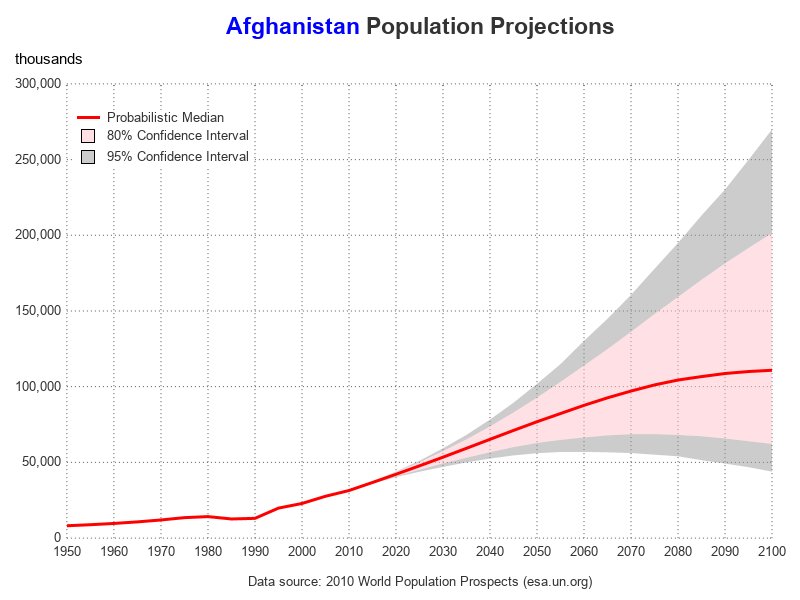 Here are the population projections for a few other countries, in case you're curious. Note that these projections were done about 10 years ago, using the data available in 2010. 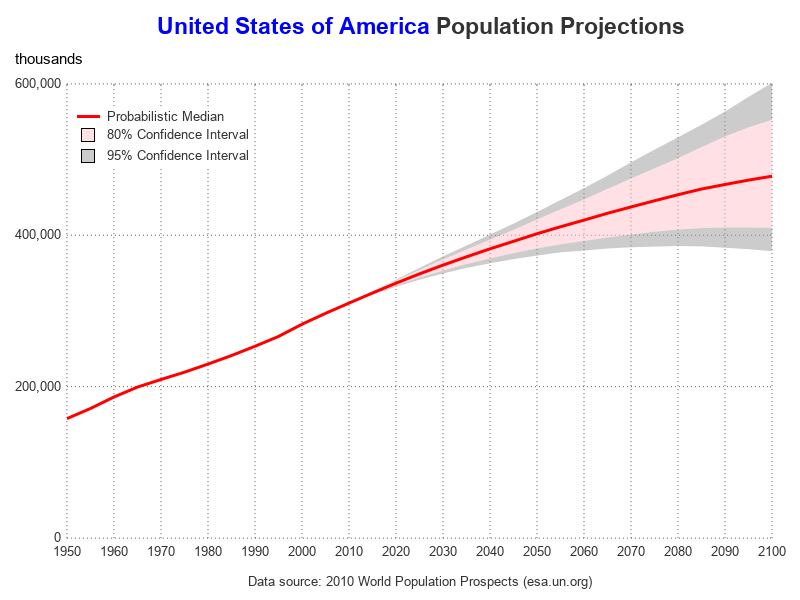 Do you think the projections using the upcoming 2020 census data will be different? 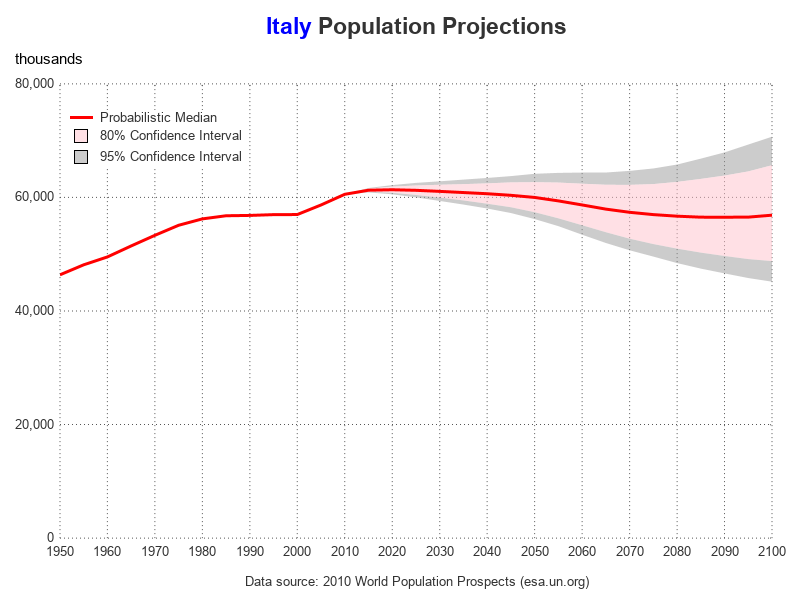 What are some factors and developments in the past 10 years, that might change the population projections? 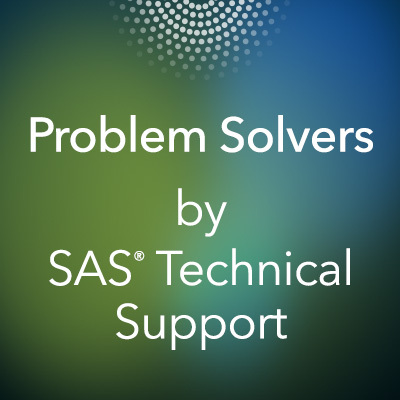 Here's a link to the complete SAS code, in case you want to see all the details. 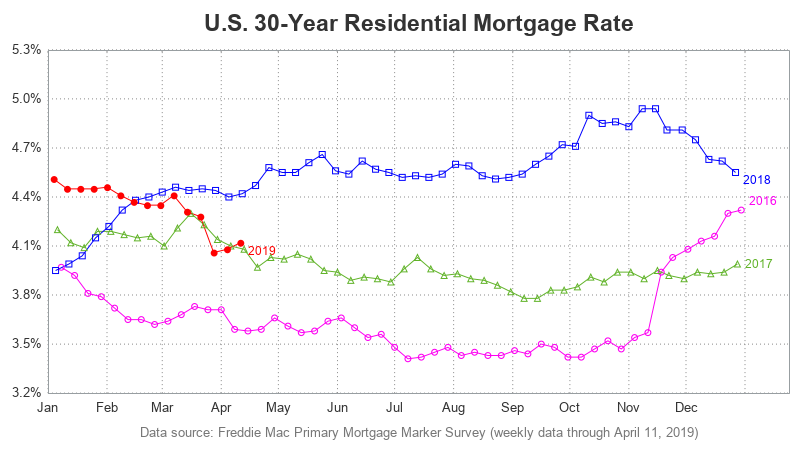 Nice graphs. 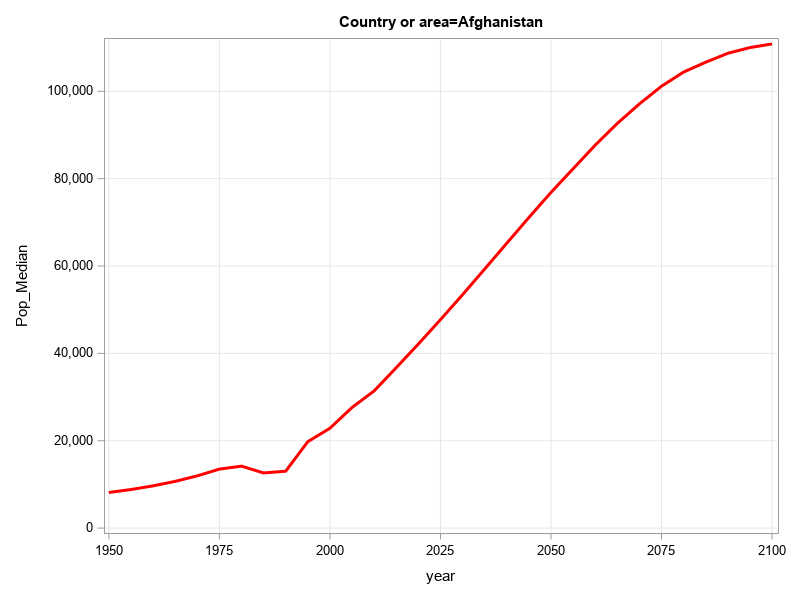 In addition to the techniques you've demonstrated, some analysts like to shade the portion of the graph that corresponds to the future. One of my posts shows how to use the BLOCK statement to highlight the future predictions. You can also use the GROUP= option on the SERIES statement to change the attributes of the median curve. For example, you can make it solid for the past but dashed for the future. 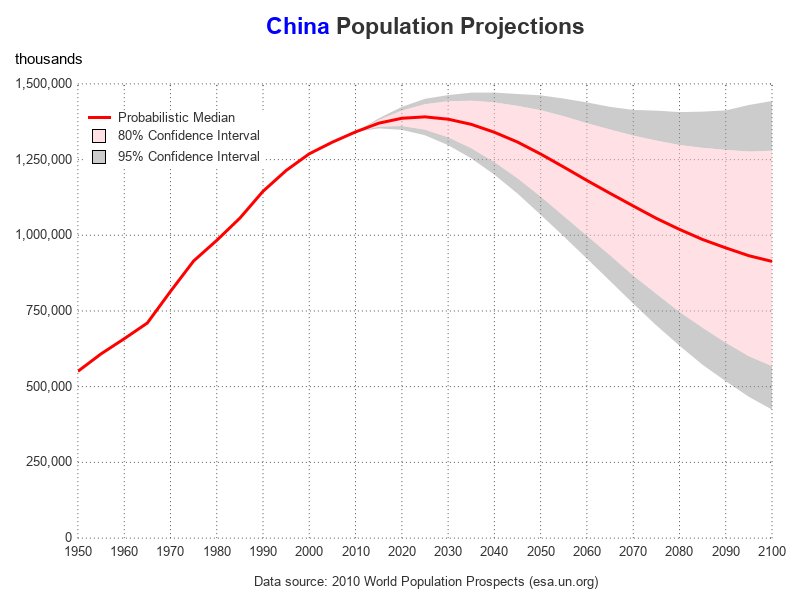 That China graph is amazing. I would like to see your graphs for India and Japan.